Thanks to all for the good wishes about my sesame challenge yesterday. Before I was allergic (the allergy first surfaced when I was in my mid-30s), sesame bagels were my favorite, Chinese food was my favorite, and Whopper Juniors from Burger King (sesame buns) were my favorite. One of my unscientific theories has been that I ate SO MUCH sesame as a young adult that I brought this allergy on myself somehow. I had sesame oil in my kitchen and had just cooked with it the week before my very first allergic episode. Anyway, there’s a sesame bagel for old times’ sake. It definitely feels like we’ve been talking about the Giants’ outfield deficiencies forever, or at least since around 2013 or so. The World Series champion 2012 Giants had a pretty good outfield. Early in the season, it was Blanco, Pagan, and Melky Cabrera. Later (starting in August), there was Hunter Pence. That group of outfielders (which also included Nate Schierholtz until he was traded for Pence) put up doubles, triples, stolen bases, good defense, and lots of hits. So here’s what we have as of Feb. 2, including yesterday’s addition of #ForeverGiant John Andreoli (more on him in a minute). 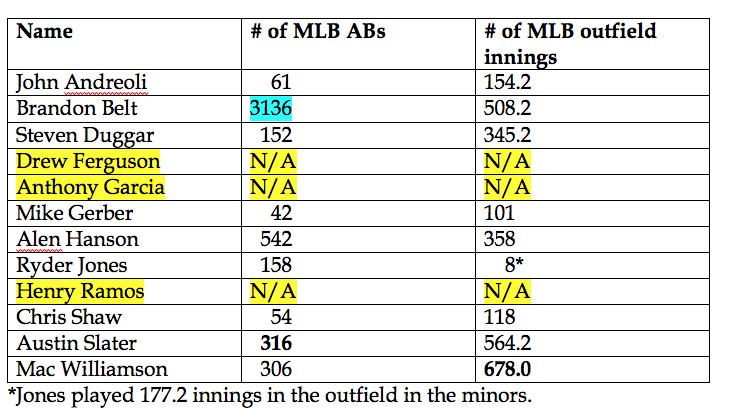 This chart includes all of the outfielders on the current 40-man roster, infielders who also play outfield (Belt, Hanson, Jones), and the non-roster invitees (Ramos, Garcia and Gerber–Gerber still has a spring training invite). This is…wow. This is a lot of inexperience. Twelve guys will be in camp who could potentially play the outfield. The leader in ABs is Slater at 316 and in innings is Mac Williamson at 678. Belt is a first baseman and an occasional reluctant left fielder. Hanson and Jones are primarily infielders, and even Slater has moved between the infield and outfield his whole pro career. Now, in the Zaidi Regime, such versatility is considered a good thing, but it can also mean “mediocre everywhere” (Hanson, for example, hasn’t impressed me defensively at any position he’s played. Hanson in the outfield gave me the shudders.) The only true dedicated outfielders on the list are Andreoli, Duggar, Williamson, Shaw (sort of) and non-roster invitees (Garcia, Gerber, and Ramos). However you slice and dice this, it’s pretty slim pickings. #SFGiants are pursuing multiple players and looking to make offers. Looking mostly at position players to fill depth and OF needs. Agents would call them lowball buds, the team might put it this way: they are looking for “opportunities” in a tough market. Heyman also listed the Giants, in a different tweet, as among the teams still looking for starters, which also seems plausible. I was surprised last week when the Giants DFA’d Mike Gerber after signing Drew Pomeranz. With nine cajillion pitchers and tons of lefties on the 40-man roster, it didn’t make much sense to me that you’d slice from your already-thin outfield corps. So now they’ve gone the other way, picking up an outfielder off waivers from the Rangers (John Andreoli) and DFA’ing right-handed reliever Derek Law. Here’s a photo of Andreoli. Anyone get a Ryder Jones lookalike vibe from this? I went looking for a picture of Andreoli and found one of him wearing a Mariners cap (he briefly played for Seattle last season). 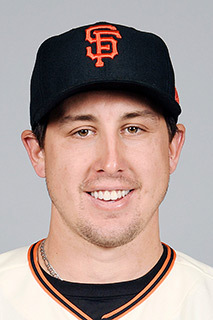 As I was clicking on the photo, it magically changed into a Giants cap, even though they just got him yesterday. The miracles of technology! After leaving the game, Law spent the rest of the night waving an orange rally towel — provided by a fan — on the top steps of the dugout. “Even when he was out of the game, he was doing a pretty good job of cheerleading, too,” Bochy said. But then Game 4 happened. The Giants went into the top of the ninth leading 5-2, just needing three more outs to take the series back to Chicago for a decisive Game 5 with Johnny Cueto ready to go and Bumgarner available in the bullpen. In a decision that is still questioned by some Giants fans, Bochy pulled Matt Moore, who’d been dominant for eight innings, and handed the ball to Law, who gave up a bleeder single that just got by Brandon Crawford. Out came Bochy with a quick hook, and the rest of that inning will go down in Giants infamy. Did that final moment shake Law’s confidence, something to stew over the whole winter? Law came into the 2017 season expected to be the set-up man for new closer Mark Melancon. Opening Day in Arizona was a dark foreshadowing of one of the worst seasons in Giants’ franchise history, with first Law and then Melancon blowing saves after Bumgarner’s two homers had started the Giants off with a bang. It was also the beginning of the end for Law’s Giants career. 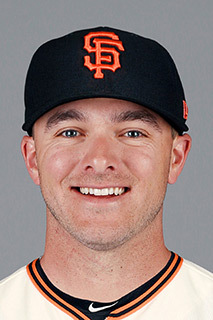 He had a brief bright spot in May, when he stepped in for an injured Melancon and converted four of four save opportunities, but by June he was pitching so poorly that he’d been demoted to AAA, and he pretty much was an afterthought from then on, appearing in only seven games for the Giants in 2018 while fellow righty prospects Reyes Moronta and Ray Black passed him up. 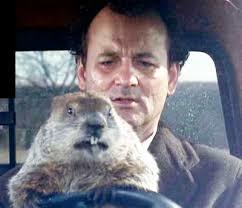 And now he’s been DFA’d. Will he clear waivers and return to the Giants? I’m guessing someone out there might remember his rookie season and think they can fix him. He’s still just going into his age-28 season. So goodbye–maybe–and good luck to DLaw. We’ll always have 2016. Here’s a nice article by Dalton Johnson of the San Jose Mercury News on top Giants pitching prospect Logan Webb. He’s one to keep an eye on this spring and season. I’m assuming he’ll start the year at Richmond. Two other off-the-field “signings” were Grant Brisbee, leaving SBN to join The Athletic and co-cover the Giants with Andrew Baggarly, and Dave Flemming signing a four-year extension with the Giants, even upping his contract from 130 games per season to 140. I think both of these developments are great news for Giants fans. Flemming is, in my opinion, a superb play-by-play man, and his partnership with Jon Miller has become epic over the years. Brisbee is funny and silly, but don’t let that fool you. He’s also insightful and he can really write. With him, Baggarly, Dan Brown, and Melissa Lockard covering the Giants’ minor leaguers, Giants fans subscribing to The Athletic are really spoiled now. The Fan Fest is one week from today. Pitchers and catchers report in Scottsdale in ten days. Baseball is almost back, and even if everything is coming up bagels in the outfield right now, it’s still baseball. 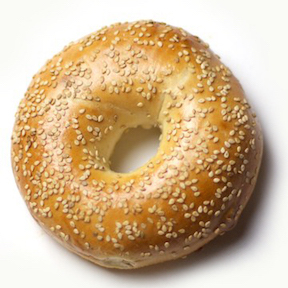 Have a sesame bagel for me today–Lefty out.